To strike the error of the lawless Hagarenes. 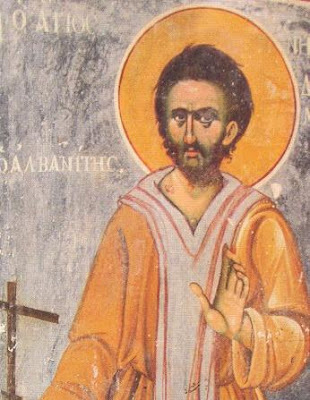 Saint Nikodemos was born in the city of Elbasan in Albania to pious parents. When he came of age he went to Berat where he practiced the trade of tailoring. He then married three times, for each time his wife died at a young age and he was left with many children. When he tried to marry a fourth time, he was not permitted in accordance with Orthodox Canon Law. This left Nikodemos bitter, so he went to a Muslim bey to ask for his servant as his wife, but the bey would agree only if Nikodemos converted to Islam. In his desperation to marry a fourth time, Nikodemos accepted the bey's offer and agreed to convert. Nikodemos therefore professed Muhammad to be a Prophet of God and accepted the Koran as divinely-inspired. He became a devout Muslim and desired all of his children convert with him. This was deemed unfortunate by the pious Christians who knew the family, so while all the children became Muslims, certain Christians secretly took the oldest son and brought him to Mount Athos to escape conversion. When Nikodemos heard of this, he went to Mount Athos with the intention of recovering his son and taking revenge on the monks. Arriving at the Holy Mountain of Athos in search of his son, Nikodemos suddenly had a change of heart and repented of his stubborn refusal to abide by the rules of the Church. Nikodemos therefore decided to stay at the Holy Mountain to repent of his sins and return to his ancestral Orthodox faith. Yet he went beyond that, for after some time he even became a monk and retained his name Nikodemos. For three years he lived in strict ascetic discipline at the Skete of Saint Anna in the Hut of the Ascension, but he was haunted by the saying of Christ, that whosoever denied Him before men would be denied by Him in return, but if they confessed Him before men then they would be equally accepted by Him. One day Nikodemos went to Saint Akakios of Kavsoklayva and revealed to him his plans to be a martyr. Akakios blessed Nikodemos and placed a rod in his hands, saying: "Take this rod and go to the pasha, and with the power of God, you will complete your martyrdom well." This blessing of Saint Akakios was reinforced by a vision he had of the Theotokos, who held a crystal chalice in her right hand and said to him: "Open your mouth and accept this chalice, for it will strengthen you. Confess Christ where you denied Him." When Nikodemos tasted from the chalice, it was bitter like vinegar. He was then told that martyrdom was also bitter but only for a short time, for the sweetness of Paradise is everlasting. When Nikodemos revealed this vision to Savvas his elder, he was told: "Go and do what the Theotokos has revealed to you." The other fathers of the skete met and after conducting a prayer service, they sent him off with their blessing and the farewell advice: "Go in peace and may the Lord and Savior strengthen you." Nikodemos then set foot for his journey back to his homeland where he had denied Christ, preparing himself for his martyrdom with strict fasting and temperance. He went to his former workshop dressed as a monk, and all those who recognized him were surprised by his appearance and were in disbelief. When he was asked if he was the same person, he said: "Yes, I erred and was illumined by Jesus Christ and became a Christian once more." When his former Muslim friends heard this, they took him by the hand to the judge. When Nikodemos confessed his faith in Christ before the judge, he was beaten and thrown off the city walls of Berat, but he miraculously survived the fall. Muslims then continued to beat him till he was covered in blood. Nikodemos' response was: "O God, send your help from Your holy place and strengthen me to finish the martyrdom in Your name." And to the Muslims he said: "Hit me some more so I can join my Christ a bit sooner." Meanwhile the demogerontes (distinguished elders of the Christian community) from the villages of Sinje, Poftal and Sadovic came to Berat to announce their willingness to convert together with their fellow villagers to Islam, but when they saw Nikodemos and his willingness to die for his Orthodox Christian faith, they changed their minds, returned to their villages, and remained Orthodox Christians. Nikodemos was then examined by the vali, and as was customary he was flattered and promised riches if he converted back to Islam, yet if he refused he was threatened with death. Nikodemos remained steadfast in his confession, and for this he was subject to torture. Seeing that he remained firm with no intention of denying Christ as the true God, the vali sentenced Nikodemos to die by beheading. After Nikodemos was beheaded on July 11, 1722, certain Christians bribed the vali to secure his permission for them to bury Nikodemos. He was thus buried in the Church of the Theotokos at Mangalem in Berat, and there his sacred relic became a source of miracles. In 1967 many churches and monasteries were destroyed by the Communists in Albania, and this included the resting place of Saint Nikodemos' relics. However, a devout Orthodox Christian Ilia Kotsi recovered the relics and kept them hidden. A few decades later they were given to the Monastery of the Theotokos in Elbesan. A portion of his relic is also at the Skete of Saint Anna in Mount Athos.